For more information about this Proven Safety Countermeasure, visit the Office of Safety's Road Safety Audits website. 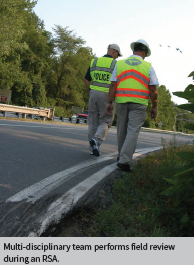 A road safety audit is a proactive formal safety performance examination of an existing or future road or intersection by an independent and multi-disciplinary team. Source: Road Safety Audits: An Evaluation of RSA Programs and Projects, FHWA-SA-12-037; and FHWA Road Safety Audit Guidelines, FHWA-SA-06-06. Reduced number and severity of crashes due to safer designs. Reduced costs resulting from early identification and mitigation of safety issues before projects are built. Improved awareness of safe design practices. Increased opportunities to integrate multimodal safety strategies and proven safety countermeasures. Expanded ability to consider human factors in all facets of design. RSAs can be performed in any phase of project development, from planning through construction. RSAs can also be conducted on any size project, from minor intersection and roadway retrofits to large-scale construction projects. Agencies are encouraged to conduct an RSA at the earliest stage possible, as all roadway design options and alternatives are being explored.